From higher home heating costs to lower pensions, Ukrainians are about to feel the pinch from austerity measures attached to a newly approved International Monetary Fund (IMF) loan package. The long-awaited $17.5 billion credit announced this week holds out hope of an eventual economic recovery for the country. But that comes down the road. But the deal’s success is contingent on the government making deep and immediate cutbacks that could scuttle the program long before it has a chance to work. On March 11, the IMF announced approval of the assistance program, which — along with other measures, such as restructuring the country’s debt — is hoped to inject around $40 billion into the ailing economy. The IMF’s mission chief for Ukraine, Thanos Arvanitis, praised the four-year bailout as both ambitious and comprehensive. The program “tries to bring immediate stabilization in the economy, as well as lay the basis for sustainable growth over the medium term,” he said. Ukrainian citizens interviewed this week on the streets of the capital, Kyiv, however, were far gloomier about the accord’s chances of success. Among the IMF’s requirements for the loan package is a dramatic reduction in subsidies the government pays for natural gas to allow people to afford to heat their homes. Gas prices for many consumers are expected to triple in the coming weeks. The IMF is demanding an end to the subsidies as a way of cutting Ukraine’s overall budget deficit, which last year came to whopping 7 percent of GDP. A lower deficit means the country has to borrow less money to pay its bills and, hence, has lower interest payments. A higher heating bill is just one of many sacrifices average citizens are being asked to make, even as war threatens to engulf the far eastern part of the country. Retirement and unemployment benefits are set to be cut substantially. All this comes amid a rapidly weakening economy. The IMF predicts Ukrainian GDP will shrink by 5.5 percent this year, after dropping nearly 7 percent last year. The number of unemployed workers is expected to grow rapidly. The unemployment rate is now predicted to rise to 11.5 percent this year, compared with 7.3 percent in 2013. Earlier this month, the Central Bank raised the main lending rate to a world-leading 30 percent. This virtually assures that local lending and investing, at least for the time being, will not propel any kind of meaningful recovery. 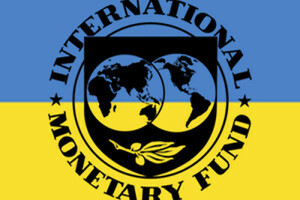 Even the IMF itself has expressed serious doubts that the Ukrainian loan program can succeed. A report published on March 12, a day after the loan package was announced, says there are “exceptionally high risks” to the program ever succeeding. The report says a positive outcome is contingent on at least a couple of factors outside the country’s control. The main factor is the ongoing conflict with Russia in the east of the country. While a shaky cease-fire continues to hold, the IMF has said in the past a return to major fighting would jeopardize future loan payments. The report also says success depends on Ukraine’s ability to renegotiate its existing loans with public and private creditors. Ukrainian Finance Minister Natalie Jaresko said talks with creditors would start on March 13 and last two months. Russia holds around $3 billion in outstanding Ukrainian debt, and it’s not yet clear how willing Russian negotiators might be to restructure payments to Kyiv’s advantage. In spite of the difficulties, the long-awaited IMF program came as comparatively good news amid a sea of gloom. In announcing the package on March 11, Ukrainian Prime Minister Arseniy Yatsenyuk emphasized the immense psychological benefits of the international support as the country remains locked in a struggle with Russia. International currency markets, too, seem to be cautiously optimistic. After going through near free fall on markets a couple of weeks ago, the hryvnya appears to have stabilized in value. In late February, the hryvnya had fallen to a record of near 34 to the U.S. dollar. In recent days, the currency is trading at around 22 to the dollar.